Backyard Stone Fire Pit | Habitat | Kids VT - small people, big ideas! On a crisp Vermont evening, there's nothing like toasting marshmallows over an open fire. Two years ago, however, things got a bit too crispy for the Karpinski family when they lost their vacation home — a condominium at Sugarbush Resort — to a fire that may have been caused by a neighbor's wood-burning fireplace. Still, the Karpinskis kindled a passion for gathering around a fire as a family, which sparked an idea when they built a new home in South Burlington last year. "We always wanted some sort of fire element," says dad Erik, "and we'd never had a fire pit before." Enter Wagner Hodgson Landscape Architecture. The firm collaborated with S2 Architecture and Church Hill Landscapes to create an outdoor entertaining space for the Karpinskis. It has a partial view of the Adirondacks, and at the center stands an elevated wood-burning fire pit. It was challenging to find one long stone slab to serve as a backdrop, so landscape architect Keith Wagner pieced together two chunks of dense schist that he got from a quarry in southern Vermont. He devised a clever way to hold them together and keep the pit looking pretty — a zipper of metal bolts running up the back. A flat piece of cold-rolled steel is affixed to the stone, with five metal fingers jutting out to hold the wood. "When people come over, they joke that it's a floating fireplace," says Erik of the 16-inch gap between the bottom of the stone slab and the ground. 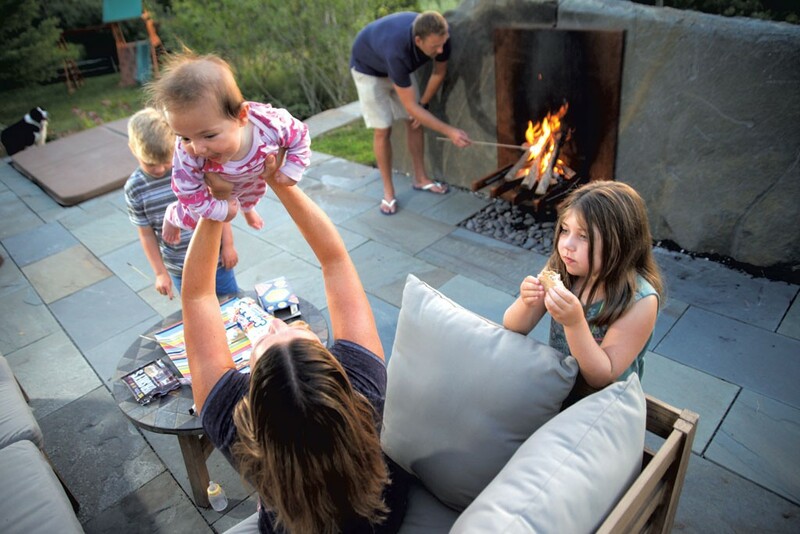 "We use the fire pit most in the fall: It's entertaining; it's time with the kids." 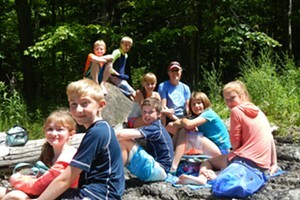 Adds mom Jennifer, "It's a space to gather with no technology — we just sit." The Karpinski kids are especially pleased with the end product. Three-month-old Kassidy stays snug in her pajamas on gray couches set around the space, while Dylan, 8, loves the warmth at nighttime. Meanwhile, 6-year-old Morgan doesn't miss a beat when asked her favorite aspect of the fire pit. "Sometimes," she says, "we have s'mores." Some stones can be damaged by the heat of a fire. Consult someone who knows what works for a fire pit. If the fire pit is in the ground, be sure to have a drain and ventilating slats for the fire to burn properly. Consider the predominant wind direction when planning the site of the fire pit. Don't make the pit too large, which might cause you to overfill it with wood and create a fire that is dangerously big.